It was like an ordinary event for me. Earth and I headed to Red Panda in Kapitolyo for the Warner TV Media Appreciation Night. 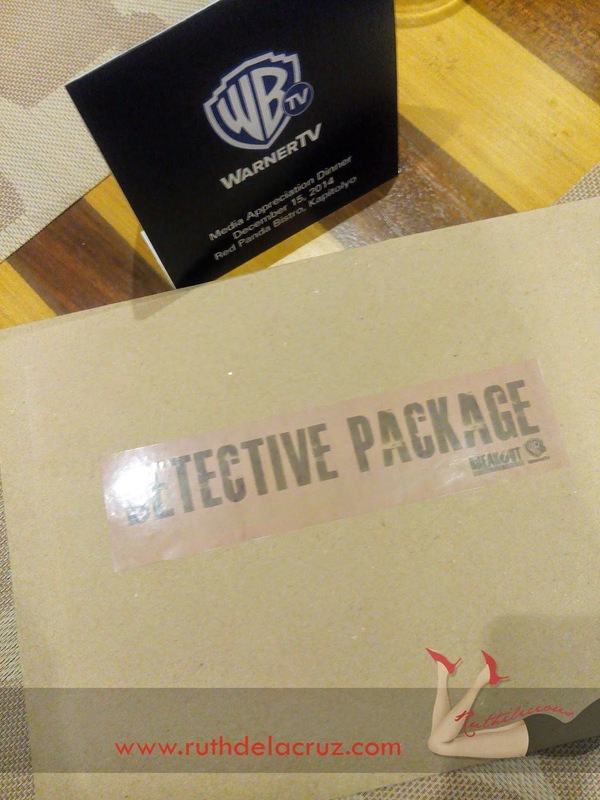 It was an amazing year for Warner TV especially after the premiere of the Gotham. We fell in love with the place and took gazillion pictures. When the event started, we were interrupted by two investigators announcing that the chef of the restaurant was just murdered. I remained calm, composed and relaxed (but inside me was excitement ready to explode!). Then, it was announced - we would take part in the investigation! In real life (and in a real crime scene), they don't get guests and civilians to help in the investigation. But last night, Breakout Philippines - Breakout Interactive Theater staged the whole drama for the event. I am sure you have heard about the Breakout Philippines - it is the first real escape room in the Philippines. The Breakout Interactive Theater is an interactive murder-solving game between actors and audience. We were given Detective Kits which contained notebook, pen, and report which we needed to submit in an hour. What we needed to do is to talk to the people in the restaurant who were in the crime scene (we only needed to talk to the people with Breakout Philippines badge). Red Panda was operational that night and there were actual guests and we didn't want to create chaos by asking them questions! Haha. From the second floor, we first met Joe (a waiter who got demoted from Sous Chef position). He said he saw the victim's body in the kitchen and he just came from lunch break. He mentioned Myka who was with him when he found the body. Off we looked for Myka (restaurant manager) - she said she saw the body in the smoking area. I asked how's her relationship with the victim. She said they are okay and the victim was good with everyone. We found a "driver" outside Red Panda (driver of David - business partner of the restaurant) - he said he didn't know about the crime that took place that night. That was his first statement. When we talked to David who was smoking outside, my initial question was - how did he know about the crime? He said he was just there when he heard a girl scream coming from the kitchen (we were thinking if it was Myka). 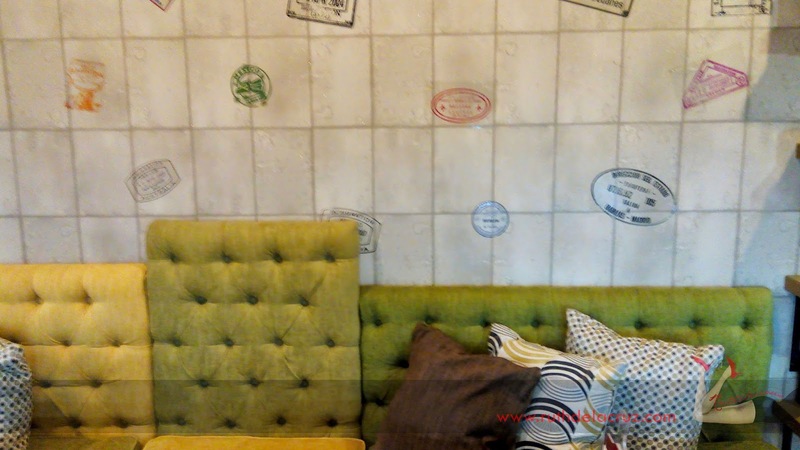 We asked, kitchen or smoking area? He said kitchen. He "doesn't personally know Chef". We also talked to Mr. Sanchez who was with a guy who was always on the phone (named JB - he said, "he doesn't want to be disturbed"). He said he was just there for a meeting. David invited them and then the crime happened. He doesn't know the Chef but they heard the girl screamed from the kitchen. When Earth and I talked about the details that we have gathered. We were both thinking it was Myka who did it as she was the only one who has an inconsistent statement about the crime scene. "Is Chef a smoker? Does he ever smoke?" - I so wanted to pin Myka for the inconsistent statement. Most of them said, they have not seen the Chef smoked. Saree (Mr. Sanchez's secretary) always spends time with David. David said he is married. With these new information, what all these got to do with the Chef? and the murder? In the Investigators' Desk, we found some evidences found by Group 4 - a mobile phone and order slip. Anyway, we were able to talk to Joe again and he said he found a poison beside Chef's body. I thought Joe planted it beside the Chef body and he was the waiter and he rang the order slip to make it look like Chef was trying to poison the guest. We went downstairs again and I asked David - "Are you aware that a poison was found beside Chef's body? Are you aware that Chef is trying to poison someone?" He said, he doesn't care about it. I noticed that he was already being defensive but my mind was already set that Joe (the waiter) has the motive to kill the Chef. When we finally got to talk to JB - I asked him, "I noticed you have not touched the soup, why?" He said, he doesn't like the restaurant and doesn't eat anything from this restaurant. WHY DID WE MISS THIS? and THE SOUP TOO! THE EVIDENCE! WE FORGOT TO BRING IT TO THE DESK! At that point, we were reminded that we only have ten minutes to submit the report. When Earth and I talked about the evidences, I told her my initial finding is that - it was Joe who has the motive to kill Chef because he was demoted, and without Chef, he would have the position back. A little shallow, I know but he was the only one who have a direct relationship with the chef. I recognized the intent to poison JB. David set up the meeting and ask Chef to put poison in the soup. That crime, was, however prevented because Chef was murdered - and JB did not touch the soup. The love affair between Saree and David was just a side story and got nothing to do with the crime. Earth however said that Saree mentioned something like "this was not supposed to happen". But we didn't get the chance to talk and ask Saree more questions. At the end of the investigation, they all gathered the suspects (actors). 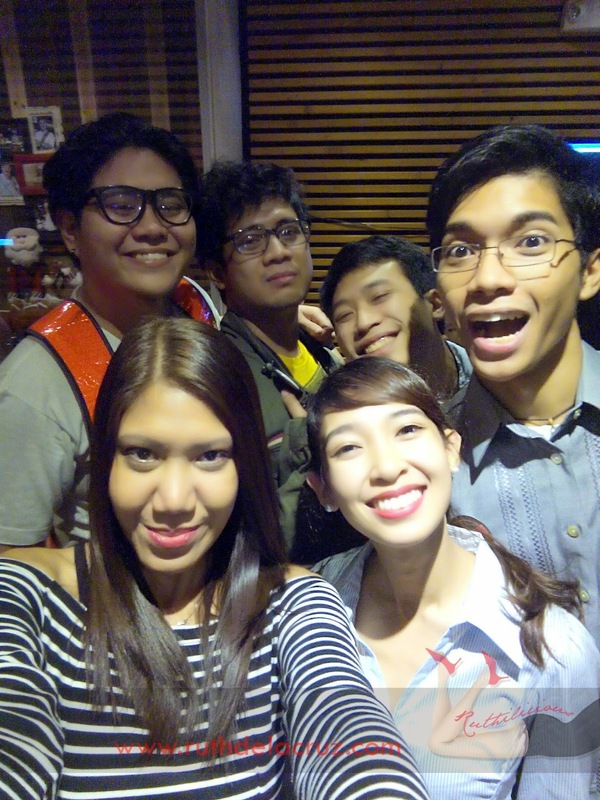 Oh, we missed interviewing the drunkard and traffic enforcer who were situated outside the restaurant! 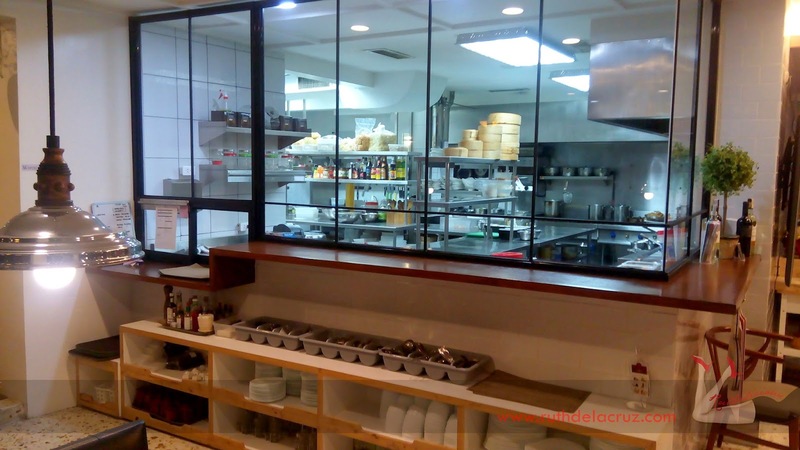 Chef was stabbed by a balisong owned by Mr. Sanchez. He did it when he found out that David intended to kill JB by asking the chef to put poison in the soup. He wanted to prevent the crime and killed the chef. However, David was also taken as suspect for the frustrated murder. The evidence was found in Saree's mobile phone recording. No one got the right suspect and the motive but Group 4 found most of the evidences and they won! The strongest evidence was the mobile phone. Congratulations Ryan and Ria! What an awesome, awesome event and game! 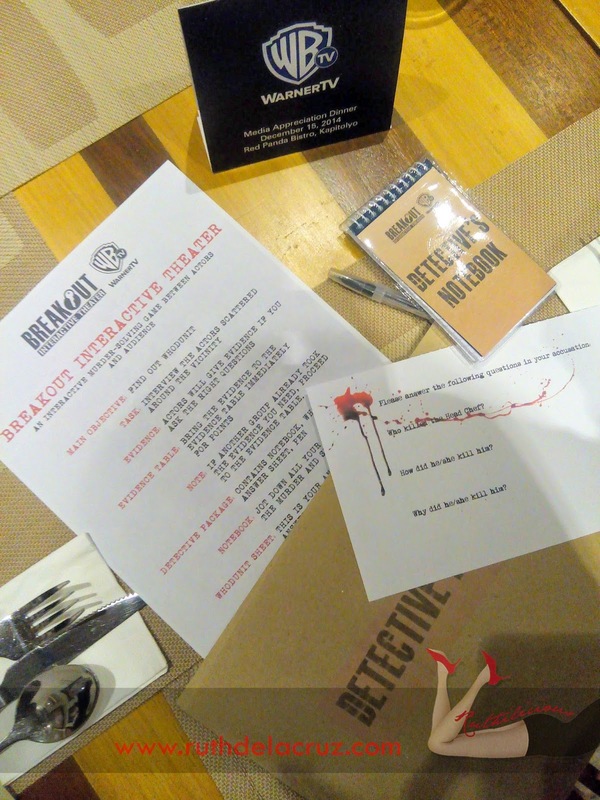 The game was rolled out by Breakout Theatrical Philippines for Warner TV Philippines to introduce the new series "Murder in the First". Murder in the First takes an up-close and personal look at a single complex homicide investigation. It is co-created by Emmy winner Steve Bochco and newcomer Eric Lodal, which spreads the story arc across an entire season, takes two seemingly unrelated crimes that pit Silicon Valley wunderkind Eric Blunt (Tom Felton) in the middle of the crime scene. Oh, I love Tom Felton! He's the most awesome actor in the Harry Potter series! I love him and his interviews! He's fun! 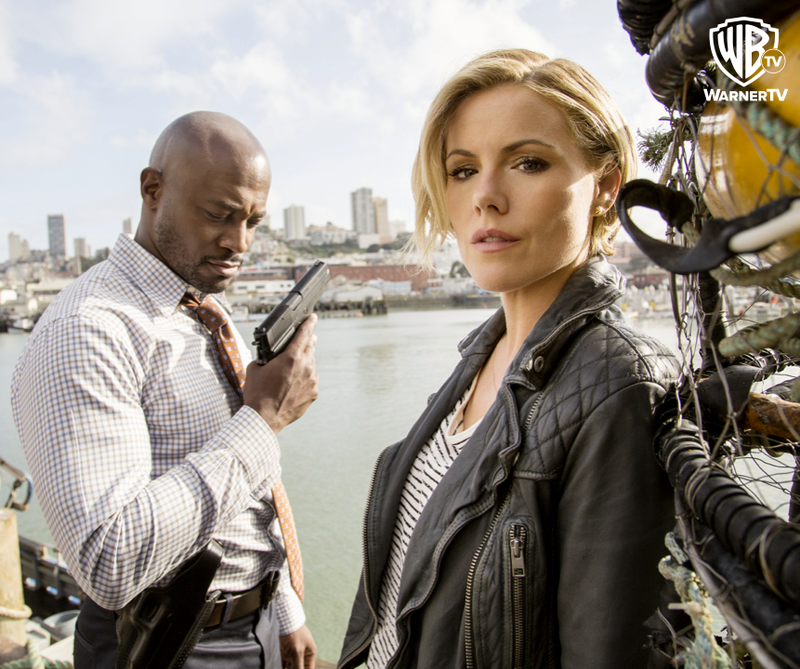 Murder in the First is set in San Francisco which follows the homicide detectives Terry English (Taye Diggs) and Hildy Mulligan (Kathleen Robertson) as they investigate two murders. The mystery deepens when they found a common denominator in the murders - Blunt (Tom Felton). I should have taken the clue from the press kit! Haha. Anyway, it was an awesome event! Such a creative story and direction by Breakout Interactive Theater. The actors are really good and are in character. It is a whole new experience for me. Again, I tell my friends I don't earn much from blogging, but I do earn experiences, and this is one of the most awesome I have experienced. Now what do we learn from playing detectives and solving a crime? Ask the right questions that would lead to the clue. People would unknowingly share details if you ask the right questions. Ask all the suspect the same question and do elimination. Relation to the victim would have strong evidence for the crime - but the closest one would not always mean he/she is the suspect - take that case of Joe, the waiter. Ask each person their relationship with each other and to the victim. Take note of the person's behavior during interrogation. I should have noted how stressed and nervous David looked the whole evening! And Saree looking lost and smoking the whole time - she knew something! While JB and the rest of the actors were just cool when we asked questions. Take all the evidences that you found! Lesson learned from us! Anyway, for more thrilling nights and cases to solve, tune in to Murder in the First on Warner TV on Thursday at 9:50 pm. Here are some of the awesome actors of the Breakout Interactive Theater! Warner TV offers viewers in Asia Pacific an unprecedented mix of hit TV Series and blockbuster movies. Its line-up boasts the world's biggest franchises, first-run exclusives for the region and fan favorites across a wide range of genres from action, adventure, comedy to crime, sci-fi and drama. Warner TV is also home to feature films from legendary studios of Warner Bros. Entertainment. The channel is available across Asia Pacific which is owned and operated by Turner Broadcasting System Asia Pacific, Inc.